The boom of the social media popularity has changed the dynamics of various industries. Several firms are trying to utilize its potential by implementing creative ideas related to marketing. Using social media as a medium of customer support is also gaining momentum due to multiple benefits connected to it. Even small and mid-sized companies along with traditional businesses are also realizing the importance of providing customer support through social media. These companies can take support of contact center outsourcing to make sure that customer loyalty is maintained. Let’s look every reason which proves that social media is now an inevitable part of customer service. While posting a response to the customer query, you can also post suggestions for the customers. These suggestions can contain a product or a list of product which customers will definitely consider if issue is resolved in proper manner. Offering good customer service is one facet of positive brand promotion. Staying active on social media websites is another important dimension which tells the customers that you are updated as per present trends. And customer will definitely trust this updated and active brand among the choices available in the market. While posting queries, the customers will be mentioning the brand on social media websites. This will ensure that the contacts of that customer are able to see your brand which ultimately increases the visibility. So, this will indeed act as a form of social media marketing without spending extra bucks. A customer posts a query on social media because he wants to tell others on internet about the issue. Also, he expects that companies will response quickly and effectively due to transparency involved in this process. On the other hand, the companies by responding effectively to these queries can reinforce the trust among the followers of the brand. The contacts of the customer can also see the positive response received by the customer from company’s end. After you become sure as a company that your customer is fully satisfied with the resolution, you can ask him/her to share the experience on that medium. For example, you can write at the end of resolution on Facebook, “Please share if you are satisfied with the response.” This will definitely promote your brand in an exponential manner. 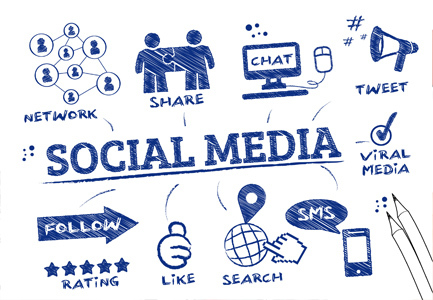 Before responding the customer, the social media agents from call centers can go through the profile of the customer to analyze his personality. This will give an idea about what kind of response will give more satisfaction. Therefore, this is an indirect but essential way of giving finest response to the customers. As per the marketing website ‘Social Media Today,’ around 1.5 million new users are added on Facebook daily. This reflects how social media networking has become an integral part of human life. Even for posting their queries, they feel more comfortable on social media channels as compared to other mediums. So, you can give them best experience by allowing them to ask queries on their favorite medium. There is possibility that customer will go through the timeline of your brand page while posting a query or after receiving a response from your end. This will raise the possibility of customer checking the posts related to specific products or services while scrolling the profile page of brand. This kind of marketing is not possible with other mediums like email or phone. Also, there is possibility that customer will ‘Like’ your profile page or follow you after receiving a positive response. After giving the most appropriate resolution, you can ask your customers if they were satisfied. In case they are not, you can try some other action which matches the expectation of the customers. It is said that a businessman inspires the most from his/her competitor. If you are from consumer-oriented industry, then the chances are high that your competitor will also be active on social media for providing customer support. You definitely would not like to lag behind by not offering an active customer service on these channels. In fact, by offering the top-notch resolutions, you can have an edge over your competitors. The renowned call centers understand the importance of customer support and implement creative techniques for this process. Therefore, the companies preparing to outsource customer service can utilize social media customer support of call centers to connect better with consumers and to increase the sales.